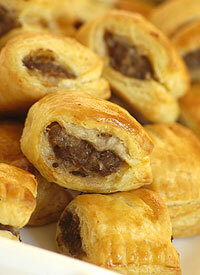 Sausage Rolls – quick and easy of course! School holiday time usually means you’re cooking more than normal for the kids, especially if your kids are in school the whole day. After breakfast you have to think of the 10.30am snack, then lunch, then the 3.30pm snack, dinner of course and perhaps the fruit or glass of milk at bedtime. Whatever your routine might be these sausage rolls are easy and quick to make and can store for up to 5 days in an airtight container. Actually I think they might last a bit longer than that but in my home they’re finished in less than 2 days…! Home made sausage rolls - yummy! 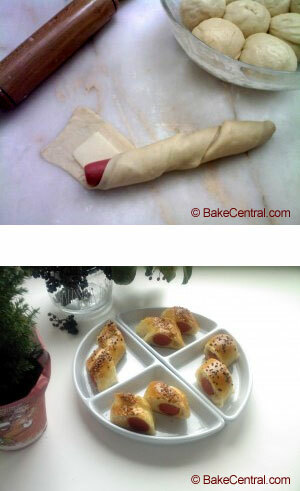 Roll out the pastry from the tube; you will see there is no need to use a rolling pin. The pastry is ready to use. Wrap a vienna in each strip as illustrated below. Then, take a sharp knife and cut into bite sized pieces and brush the tops with milk. Place pieces on greased baking tray. Bake at 180 degrees Centigrade for about 25 minutes or until golden brown. Serve with ketchup – kids love it and actually so do grown ups. You could also make this as finger food at cocktail parties as it can be served cold and doesn’t need too much work. my mouth is watering! im going to try them today evening!